Chronic electrical stimulation provides one of the "cleanest" views of muscle adaptation to increased use. This model has long been used by basic scientists to study skeletal muscle adaptation since it induces a repeatable, quantifiable amount of "exercise." Thus, we have been able to synthesize a collection of such studies in a manner that provides a fairly global view of muscle structural and physiological changes that occur in response to the stimulation. It is known that muscles which perform different tasks, in addition to having different muscle architecture, respond to different electrical input. For example, skeletal muscles that play a postural role, and thus have a high proportion of slow fibers, are physiologically activated at low frequencies. Conversely, muscles with a very high proportion of fast fibers may be activated only intermittently with high frequency bursts of electrical activity. The fact that electrical activity and muscle properties seem to be intimately interrelated, provides an experimental basis for understanding muscle plasticity. The best documented effects of electrical stimulation on skeletal muscle are those that occur after chronic, low-frequency stimulation (similar to the activity of a "slow" muscle) is imposed upon a predominantly "fast" muscle. If the stimulator is activated at a nominal frequency of about 10 Hz and allowed to operate 8-24 hours per day, a well-defined progression of changes is observed whereby the fast muscle first changes its metabolic and then its contractile properties to completely "transform" into a "slow" muscle. Based on time-series studies and single fiber biochemistry that the changes that occur result from a true transformation of a single fast fiber into a slow fiber and not from selective loss of fast fibers with subsequent slow fiber regeneration or proliferation. The fast fibers actually become slow fibers. In fact, even the physical appearance of the stimulated muscle approaches that of the more postural muscles by taking on a "deep red" appearance. Photograph of control (top) and experimentally stimulated (bottom) rabbit tibialis anterior muscles. Note the dark (deep red) appearance of the stimulated muscle which reflects the dramatic capillary proliferation and myoglobin content. If low frequency stimulation is applied 8-24 hours per day, the total transformation process requires about 8 weeks. If the stimulator is active for a shorter period of time, the transformation takes longer or may not fully occur. The earliest observed changes occur within a few hours after the onset of stimulation where swelling begins to occur in the sarcoplasmic reticulum (SR) membrane network (compare upper panel to lower panel). The significance of this morphological change is not clear but it is routinely observed. Increases are measured in the volume percent of mitochondria, oxidative enzyme activity, number of capillaries per square millimeter, total blood flow, and total oxygen consumption, reflecting a profoundly increased muscle metabolic activity. The increase in oxidative enzymes and capillary density are manifested functionally as a decrease in muscle fatigability. 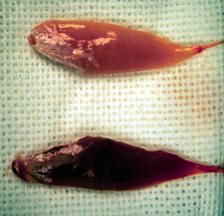 Left: Increase in the size and number of mitochondria (denoted by arrows in normal panel) present in the tissue as a result of the chronic stimulation. Right: Histochemically, metabolic alterations are reflected as an increased percentage of FOG fibers at the expense of FG fibers (represented as "darkly" staining in the simulated SDH stain). Also, note the increase in capillaries (denoted by an arrowhead). After 14 days, the Z-band begins to increase in width, and a decrease in the amount and activity of calcium ATPase is observed. Left: At this point, the width of the Z-band (shown here as a brown band) begins to increase toward the wider value observed for normal slow muscle. The significance of Z-disk width change is not known. Right: The amount and activity of the calcium transport ATPase (shown in red) decreases and changes its particle distribution within the SR bilayer. Here is an important point: just because activity increases, does not mean that all muscle proteins must also increase. Some proteins increase in amount (i.e., are upregulated) and others decrease in amount (i.e., are downregulated). The "choice" which the muscle makes depends on the goal of the adaptation. As the muscle is receiving information consistent with being chronically active at fairly low levels, it alters its genetic expression pattern to create a structure consistent with this functional requirement. In the case of decreased expression of amount and activity of SR calcium transport proteins, this can be detected physiologically as a prolonged time-to-peak twitch tension and a prolonged relaxation time of a muscle twitch or as a decrease in the fusion frequency. The myosin profile is altered with different myosin monomers incorporating into single filaments. The precise role of myosin light chains are not fully understood, however, the fact that the light chains associated with slow fibers are expressed is consistent with the fast muscle fiber becoming more like a slow muscle fiber. The heavy chain profile may also be altered at this time. In addition, muscle mass and fiber area are decreased. Left: An alteration in the myosin light chain profile is observed whereby the normally fast muscle, containing only light chains LC1f, LC2f, and LC3f, now contains light chains characteristic of slow fibers (LC1s and LC2s). Right: Finally, after such a prolonged "dose" of increased activity, muscle fiber cross-sectional area, maximum tetanic tension, and muscle mass have decreased significantly. The Z-band is the full width of a normal slow-contracting muscle and the density of T-system has decreased. At this point, the transformed fast contracting muscle is indistinguishable from a normal slow contracting muscle. (Modified from: Lieber RL. Time course and cellular control of muscle fiber type transformation following chronic stimulation. ISI Atlas of Science 1988;1:189-194). Chronic stimulation increases muscle endurance capacity, but is not an effective means for increasing fiber size in normal muscle. The decrease in skeletal muscle mass and fiber area should not be viewed as an atrophic or degenerative response, i.e., an undesirable "overuse" type of injury. Rather, it appears that fiber atrophy represents a deliberate adaptive response of the muscle fiber to chronic stimulation—perhaps to decrease diffusion distances from the muscle fiber to the interstitial spaces which contain the capillaries. As an aside, it is interesting that chronic low frequency electrical stimulation is the best way to make a muscle "weaker". This certainly should raise some eyebrows in the therapeutic community since electrical stimulation is commonly used to treat muscle atrophy. For a look at an abstract from a 1996 study we did comparing electrical stimulation training to voluntary training, click here.